Idyll Time is working hard this morning bucking a three knot flood current in Wrangell Narrows as we pull away from the Petersburg fuel dock. We have enjoyed our time in Petersburg and look forward to stopping here again on our return trip south from Glacier Bay. 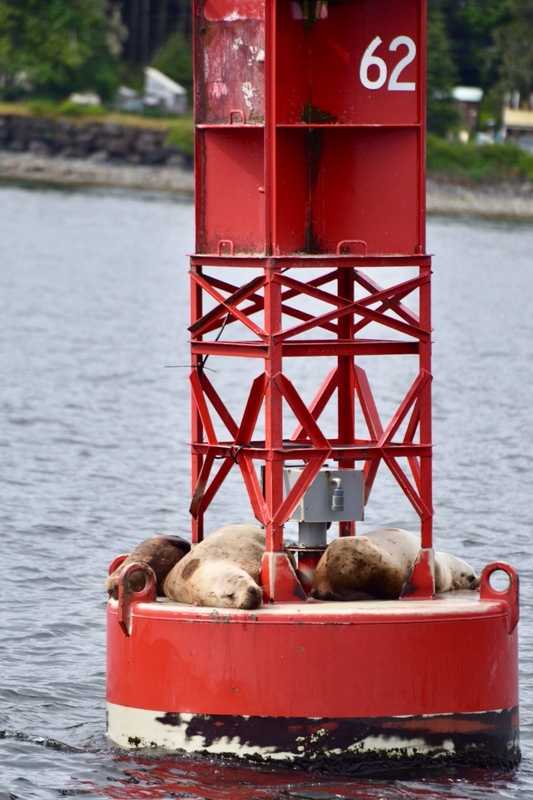 The sea lions are still asleep on this chilly morning. With the low hanging clouds, the snow covered mountains are barely visible out in Fredrick Sound. The mountains have continually increased in size and beauty as we work our way north. 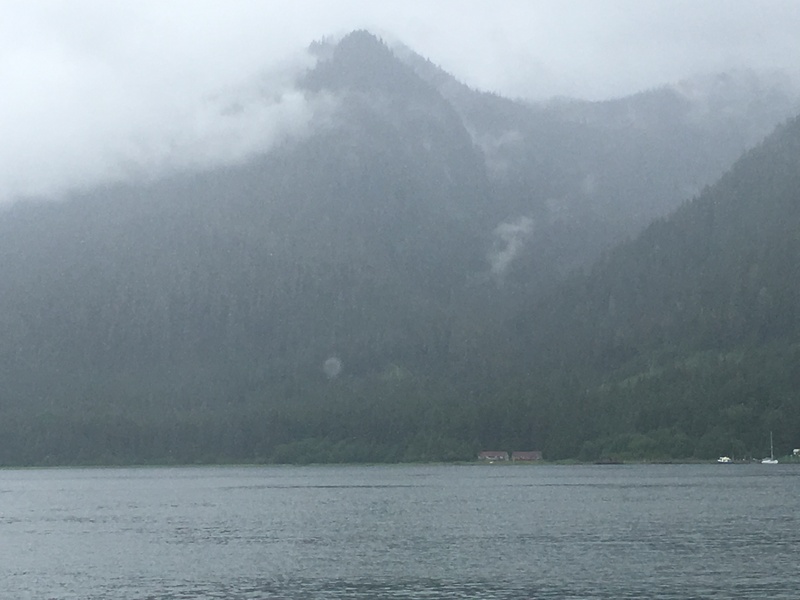 Today we are taking a detour and head south in Fredrick Sound to an anchorage called Ideal Cove. We are in search of halibut and crabs. 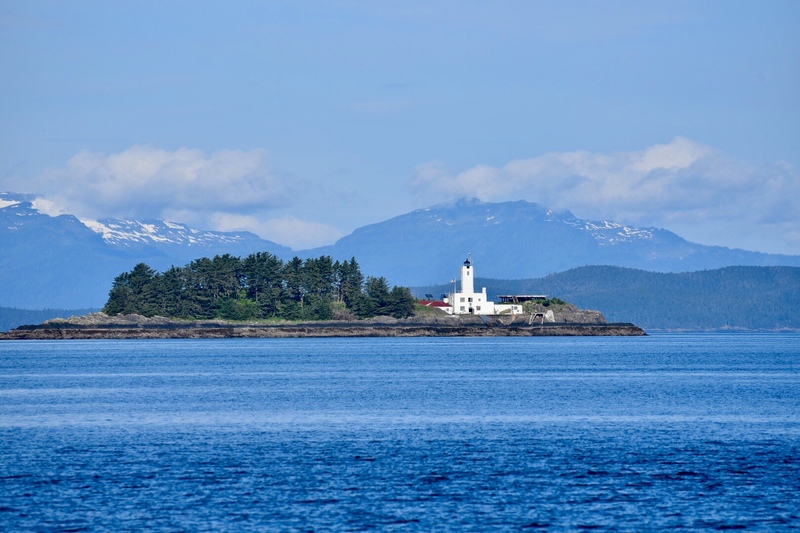 Before heading into the anchorage, we stop for several hours near Coney Island to try for some halibut. The depths here come up from over 150 feet to 30 feet. We try jigging with a new lure called a chrome bar. Jim on Rekindle had told us about this lure. We have been in constant search of knowledge on how to fish for halibut. This is much different fishing than what we were used to on the east coast. We met several locals in Petersburg and they told us about this spot. Our lucky chrome bar was not out thirty minutes before we had our first fish on. My Christmas present, a halibut harpoon, came in handy to help secure the fish to the boat. It was a small 10 pound halibut but a keeper non the less. 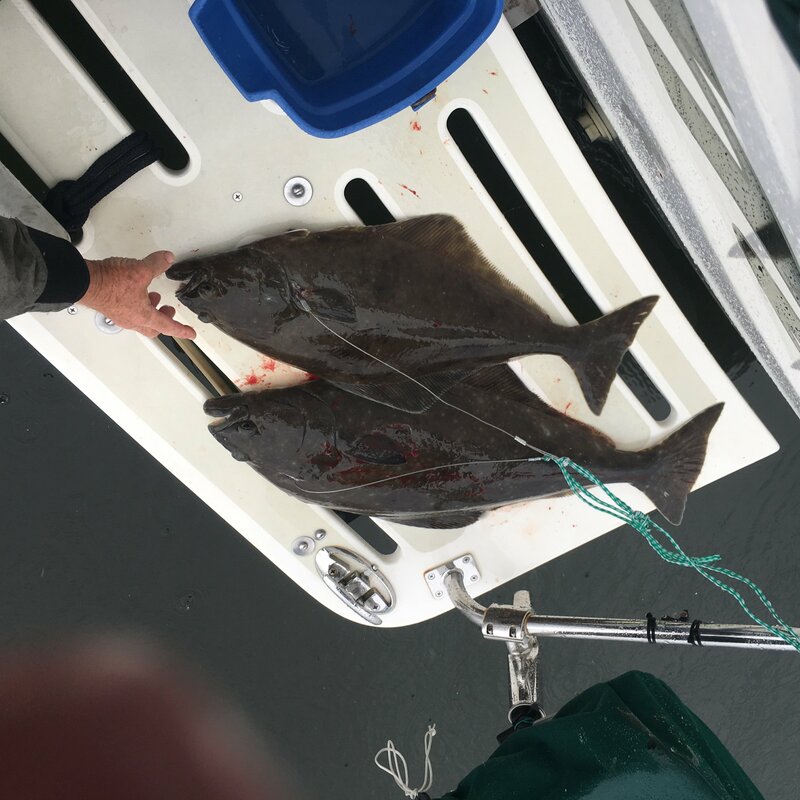 Within thirty minutes, we had a second halibut on the hook. Now we are scrambling as our harpoon tip is still imbedded in the first fish while he hangs from the side of the boat to die. Luckily, we just purchased a second tip a few days ago which we must attach to the line holding the first fish. Who would have thought we would need two tips and two lines. This halibut is bigger and gives a good fight. After a few minutes of confusion, we manage to get him harpooned before he could escape. This one is about 15 pounds. They call these small halibut “chickens”. It is not unusual to hear people landing 100 pound plus halibut. Supposedly the “chicken” size are preferable as far as meat quality goes. We will try some tonight. With the two halibut aboard, we continue on to Ideal Cove for the evening. 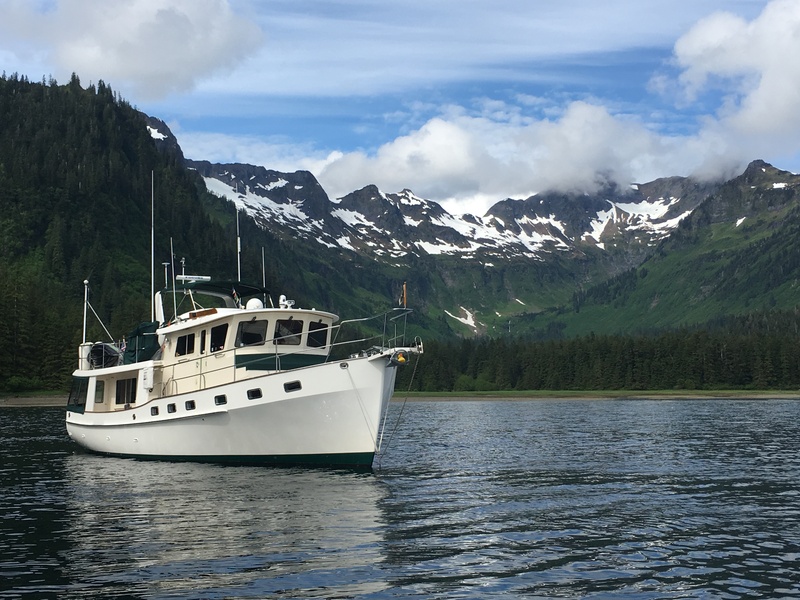 It is another beautiful anchorage just off of Fredric Sound. Our crab traps are soon in the water as supposedly this is a great crabbing area. This time next week the Cove will be full of crab traps as the commercial crabbing season starts on the 15th. At the head of the bay, we spot a pallet of crab traps ashore that a commercial crabber has pre staged for the opening day. We enjoy fresh halibut on the grill tonight for dinner. Ideal Cove turned out to be ideal for crabs. Both last evening and this morning we haul the traps to find over a dozen in each trap. It is painful to let most of them go but we keep only the six largest each day. Being out of state in Alaska, 3 each per day is our limit. We have twelve more crabs to add to our growing supply. We have an uneventful cruise north on Fredrick Sound to Cape Fanshaw. This area is complete wilderness with no sign of civilization, only dense forrest as far as we can see. Entering Cleveland Passage, we spot a row of old pilings and a rusty boiler on the beach. These are remnants of the village Fanshaw which was settled here in 1902. Several salmon canneries have occupied this site in the past. Typical of Alaska’s boom and bust cycle, the canneries were all closed by 1921 as fishing declined. Abandoned towns such as these dot the Alaskan landscape. We anchor in a small bay just across from Whitney Island. From our anchorage we can see pilings along the beach of Whitney Island which mark the site of a former fox farm. Fox farming in Alaska became popular after World War I. With vast acres of remote land available, Fox farming was promoted by both the forrest service and Alaska officials. Not being native to Alaska, the foxes did not adapt well to the island environment and soon fox farming became a thing of the past. Not wanting to put the dinghy down, we will save the island exploration for another time. Our afternoon is spent picking crab and processing the halibut. Out of the sixteen crab, we freeze six bags each containing two cup portions. We have been told to add milk to the picked crab before freezing. This helps keep the meat fresh and firm. Our freeze is getting well stocked. It is a gorgeous day on the water as we round Whitney Island and enter Fredrick Sound. The water is mirror smooth today. We even have blue sky, something we haven’t seen in about two weeks. 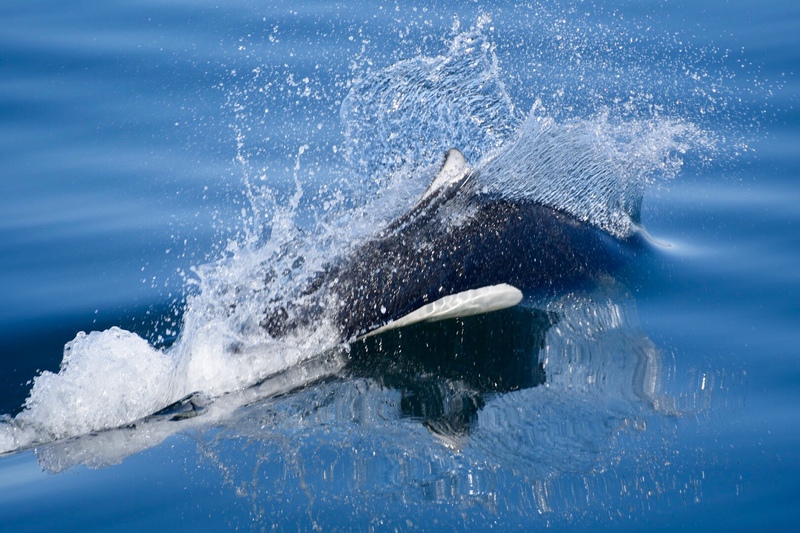 A pod of Dall’s Porpoise soon greet us and seem so happy to have our bow wake to play in. These guys are like torpedos darting in front of Idyll Time. Other than two passing cruise ships in the distance, we are all alone out on the water. Five Fingers Lighthouse soon comes into view off our bow. 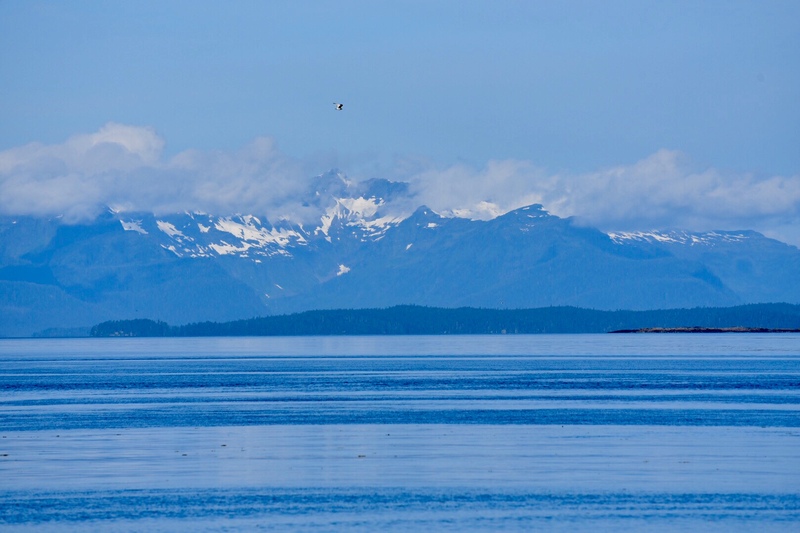 The snow capped mountain range on Admiralty Island stands tall over our entrance into Pybus Bay. As we work our way up West Channel, we spot a group of humpbacks bubble feeding. What a thrill to see these massive animals leap out of the water in unison while scaring herring into a tight ball. They then work their way through the center scooping up mouthfuls of fish. Our anchorage in Cannery Cove has to be the most scenic we have ever stayed in. 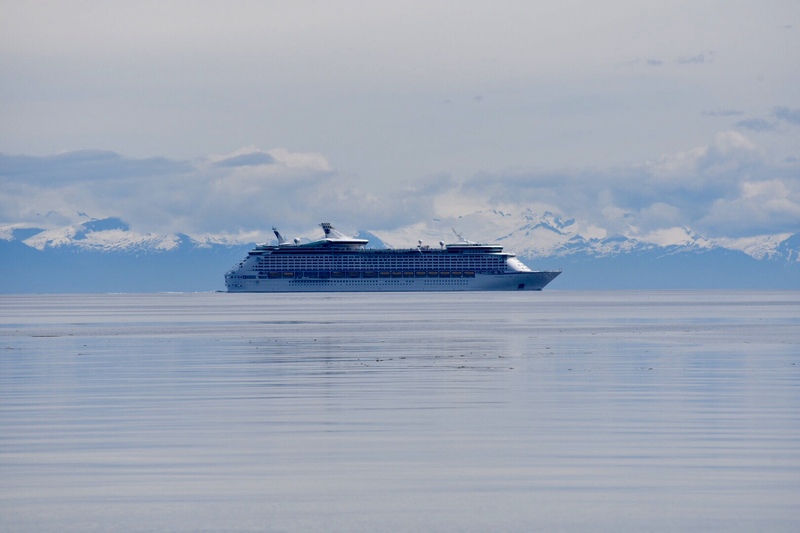 We have a great view of the snow capped mountain peaks of Admiralty Island just off our stern. We have this majestic spot all to ourselves. 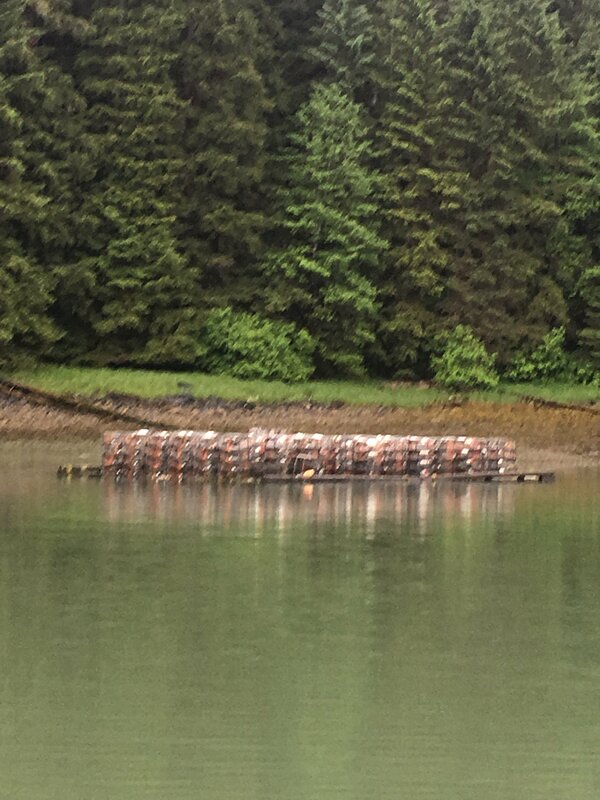 The crab pots are soon set just yards from the boat. We try our luck at Halibut fishing but only catch one small one which we let go. Dinner this evening is Crab Imperial from our catch at Ideal Cove. This entry was posted on July 4, 2018 at 3:19 pm. You can follow any responses to this entry through the RSS 2.0 feed. You can leave a response, or trackback from your own site. 2 Responses to "Petersburg to Cannery Cove"
WOW. Beautiful pictures. Especially the one of Idyll Time at anchor in Cannery Cove. Just now getting around to reading the last few entries – what a fascinating narrative, and excellent photography! 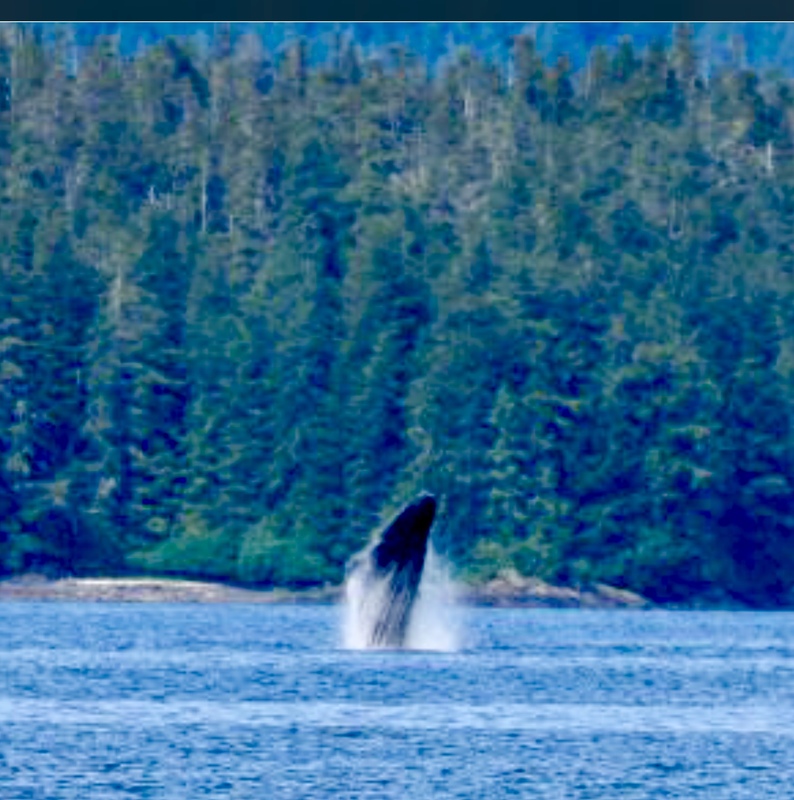 Love the photo of the whale jumping out of the water.